A novella is a narrative work of prose fiction shorter in both length and breadth than a novel, but longer than a short story. Typically, novellas dramatize individual events, or a short series of events, such as a day in the life, or an important turning point in a character’s life. While novellas normally do not have specific requirements in terms of length, the Science Fiction and Fantasy Writers of America limit novellas to 60 to 130 pages, or 17,500 to 40,000 words. Like its counterpart “novel,” the English word “novella” is derived from the Italian word “novella” (plural: “novelle”) meaning a tale; piece of news. Novellas as a literary form emerged in the early fourteenth century in Italian Renaissance literature, later gaining prestige through the late nineteenth century writings of Russian and German authors. Some famous and popular novellas include Franz Kafka’s The Metamorphosis, George Orwell’s Animal Farm, and Joseph Conrad’s Heart of Darkness. 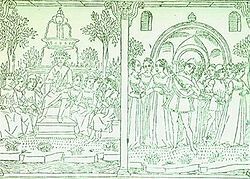 The novella as a literary form largely did not exist until fourteenth century Italy, where it began due primarily to the work of Giovanni Boccaccio and his Decameron (1353). The Decameron was a collection of 100 brief novelle—ten stories each by ten different characters all traveling from Florence to the Fiesole Hills to escape the Black Death—-following the strict etymology of a tale or piece of news. The collection made use of the 'frame story' of fleeing the city to serialize and unify each individual story. Boccaccio's form was mimicked by the French Queen Margerite de Navarre, whose Heptameron (1559) consisted of 72 short tales. Despite her literary limitations, the collection was a landmark achievement in French literature, a rich and exacting representation of her sharp, critical mind. In the English language, the earliest well-known example of novella-type literature is Chaucer’s Canterbury Tales, which, though composed mainly of verse and not prose, was a late fourteenth century homage to the Decameron. As with Boccaccio's exodus from Florence, Chaucer used the pilgrimage to Canterbury as the frame story enshrouding each tale. 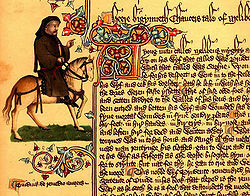 The Canterbury Tales are considered Chaucer's greatest work. However the full extent of their intended breadth was never realized, as Chaucer was unable to complete his vision and could not match the sheer volume of Boccaccio's output. Like Chaucer, William Shakespeare also drew heavily on Italian novellas in the construction of many of his plays, including Romeo and Juliet and Othello. Shakespeare took advantage of the popularity of the novella during the Italian Renaissance, which carried across the continent to England in the form of both the literature and his stage plays. However noteworthy these achievements were, the novella did not gain wide acceptance as a literary form until the eighteenth century, when German writers began to formulate regulations regarding the novella—-none of which concerned length. According to these standards, the novella (as opposed to the novel) is a story of indeterminate length focusing specifically on one event or conflict. Most often these led to a Wendepunkt, an unexpected turning point in the tale, which resulted in a logical, provocative conclusion. 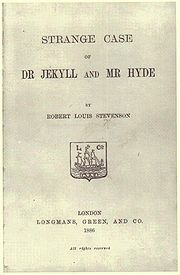 Though this format is not universally replicated by all authors or accepted by literary experts, the specification of a single conflict has particular significance to the novella. Prominent German authors who distinguished the novella during this time include Thomas Mann, Johann Wolfgang von Goethe, and Franz Kafka. 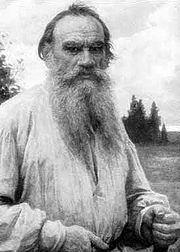 Though he is more famous for his longer works, Leo Tolstoy's The Death of Ivan Ilyich is among the best known Russian novellas. In addition to the German production, the late nineteenth and early twentieth centuries saw a great number of novellas written by Russian authors, perhaps the most famous of which was Leo Tolstoy's The Death of Ivan Ilyich (1886) and Fyodor Dostoevsky's Notes from the Underground (1864). Like the German works, Russian novellas generally magnified one particular moral theme, either analyzing or satirizing it, carrying on the practice established by Chaucer's didactic tales. The innovative and often times hyper-cerebral style of the Russians influenced future authors of the format, including Kafka and Russian-American Ayn Rand. American literature has long borrowed from the writings of other nations, and the modern American literature has featured a large number of novellas from prominent American authors, sometimes gathered in collections or as complementary material to longer novels. In the late 1800s, Henry James authored a prolific number of novellas, including The Aspern Papers, The Turn of the Screw, and In the Cage, which were all received as standout accomplishments in the brief history of American literature. In modern literature, the novella—though still less renowned than the novel—has carved a niche particularly in respect to popular culture. While most novels are too long and complex to be accurately depicted in screen adaptations, novellas are more easily adaptable, and this case has had many examples. Particular to this category is American horror author Stephen King, who has written a large number of novels and novellas that have been adapted to feature film. His collection of four novellas titled Different Seasons alone featured three novellas adapted to the screen: The Body (Stand By Me, 1986), Rita Hayworth and Shawshank Redemption (The Shawshank Redemption, 1994), and Apt Pupil (Apt Pupil, 1994). ↑ Shakespeare's Italian Connection by Nicholas A. Patricca. www.dramaticpublishing.com. Retrieved August 1, 2007.